Length/Width/Height: 177.3 x 58.5 x 69.0 in. 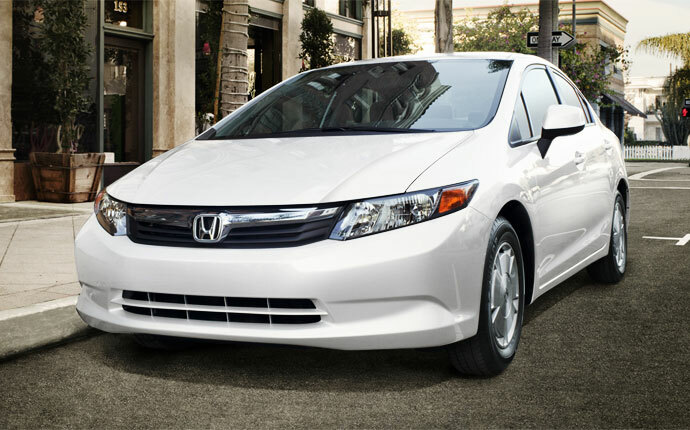 The Bottom Line: The 2012 Honda Civic isn't going to blow your mind. It will, however please you with decent performance from its 1.8-liter four, better-than-average fuel economy, classic Honda Civic good looks and a ton of new features. The Honda Civic has been a best-seller for a loooong time. It may not be the top-seller in its class, but you sure see a lot of Civics on the road, leading one to believe that Honda must be doing something right. For 2012, the Civic is all new. One interesting change is in our tester. It's the "Econ" model, and has a few details to help you drive more economically. Honda's Eco Assist technology helps enhance efficient vehicle operation at the touch of a button and also provides feedback to the driver to promote a more efficient driving style. See the speedometer references below. For one, the 1.8-liter four has decent performance with regard to acceleration and on-road oomph. The engine is somewhat buzzy on acceleration, but isn't bad when cruising. I felt the 5-speed automatic did its job well, but you could still feel the shifts. It's in the instrument panel design that you notice a big difference. For example, look "inside" the steering wheel for the speedometer and tachometer, and all you'll see is a tach. The digital speedometer is located up above, in a nacelle at the base of the windshield, with a fuel gauge to the left, and instant fuel economy and audio further right. The speedometer has two "highway" lines surrounding the speed number. When you're chugging along in normal mode, the highway lines (called an ambient meter by Honda) are blue; when you're driving economically, they're green. Obviously, the goal is to drive with the lines green all the time. Additionally, the controls are grouped into zones for audio, HVAC and vehicle controls, with tactile and shaped dials and buttons making identifying them easier when you're driving. The front seats are comfortable for long rides, even though there isn't a lot of side support. In the rear, there's good legroom, except for the tallest passengers. There's also a flat floor, so it is possible to put a third passenger in the center back there. Releases to fold the rear seats flat and increase cargo capacity are located in the trunk, where they're most useful. Passenger volume is increased by nearly four cubic feet, with a nearly two-inch increase in rear legroom. A nice feature about the compact Civic is the number of useful storage spaces. For example, the door pockets are small, but there are bottoms to the door pulls, which allows for cell phone storage. There's a small cubby by the driver's knee and a huge useful tray ahead of the shifter. There's also a USB connector in the center console/arm rest. The navigation system on the new Civic uses 16 GB of flash memory in place of the DVD-based system previously used. It allows simple, intuitive operation and has an extensive on-board database with more than 10 MILLION points of interest and voice activation. Combine that with an available audio system that offers as much as 360 watts of power and there's really no need to leave the Civic, except for occasional pit stops. All in all, the Honda Civic is its standard nice package. It has nice styling, with an aerodynamic flow that runs from the front edge through the windshield to the rear. And it's bigger inside and more comfortable with a ton of new features.